Dark Matter revealed: Credit: NASA/SAO/CXC/M.Markevitch et al. 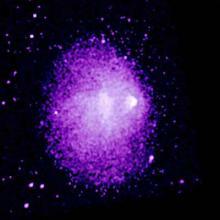 In a recent collision of galaxies known as the Bullet Cluster, scientists think they have proof of dark matter. In this cluster there are galaxies and intermixed gasses. When there was a collision, the gasses slowed more than the galaxies. Measurements showed that large amounts of mass that that should have fallen behind with the gasses continued ahead with the galaxies. "This provides the first direct proof that dark matter must exist and that it must make up the majority of the matter in the Universe." said study leader Doug Clowe, from the University of Arizona. Observations of our universe have not "fit" into our theories about how the universe should behave. To solve this dilemma, scientists "invented" what they call dark matter and dark energy. Dark matter refers to matter that does not emit or reflect enough electromagnetic radiation (light) to be detected directly, but whose presence may be inferred from its gravitational effects on visible matter. An example is when light from a known star is bent too much as it goes near a galaxy. The explanation is that the galaxy must have some invisible (dark) matter. Several other observable phenomena support that galaxies, clusters of galaxies, and the universe as a whole contain far more matter than is directly observable, indicating that the remainder is dark. A second explanation is that gravity does not behave the same way in galaxy clusters light years in size as it does on Earth. A proposed alternative to physical dark matter particles has been to suppose that the observed inconsistencies are due to an incomplete understanding of gravitation. To explain the observations, the gravitational force has to become stronger than the Newtonian approximation at great distances or in weak fields. What are dark matter and dark energy, and how are they affecting the universe? Robert Caldwell, a cosmologist at Dartmouth College, explains on Scientific American's "Ask the experts". Dark Matter is Real, Even in Theory. My name is Dr. Eue Jin Jeong a graduate from the University of Michigan, Ann Arbor, Michigan. You will not believe what you are going to see in this bog. We missed the dipole gravity all along. In 1996, I stumbled into noticing the peculiarity of the rotating hemispherical system. It changes its center of mass without the external force in the direction of the change of the center of mass which is not consistent with Newtonian mechanics. The relativistic mass increase effect makes the center of mass of the rotating hemisphere to change a little bit but not that of a rotating sphere. The inquiry into this problem resulted in the surprising discovery that we have missed the gravitational dipole moment from general relativity all along. This series of event is described in detail in the blog http://dipoleantigravity.blogspot.com/. The dipole gravity potential diagram immediately showed the existence of the jets from of the poles of the rotation axis of a ultra compact stellar object, and later found that the same dipole gravity force predicts the existence of dark matter halo and the ultimate solution to the dark matter problem. Dark matter must exist and it is essential to the solution to the dark matter problems. I have shared this info with the MOND advocates(Milgrom, Bekenstein, Zhao, McGaugh, etc) who are also tremendously surprised by the revelation. The paper was published in 1999, but at the time, focus of the paper was on the jets and the anomalous gravity effect not on the dark matter problem. I noticed that Lens-Thirring force has the sign reversed and after the correction of this error, the whole picture of the dipole gravity became transparent. It is the gravito magnet originally sought because the equivalence principle predicted that an accelerating mass must create gravity effect. There are lots and lots of information in the blog.. Please share this information with your friends..
Well, I am far from experienced enough in physics to be able to analyize the scientific validity of your claims. However, if your discovery was truly the "secret of the Universe" (as you claim on one of your websites) I think we would have seen a greater reaction from the physics community at large around this concept. The article about Dipole Gravity on Wikipedia was selected for deletion and the discussion is an interesting read, illuminating many things about the process of science. I can find no information about this theory beyond sites established by Dr. Eue Jin Jong. Again, I should say I do not have enough knowledge about the specifics of the physics you describe. I can not provide any scientific commentary upon your claims. However, common sense and some research casts a critical eye on these claims. I am asking openly in this email message what Dr. Hawking or Dr. Thorne or anybody else in the field thinks about the theory of dipole gravity. However, if you want the answer privately, send them emails and find it out yourself. I bet they wouldn't give you any answer. Because, if they say it is wrong , they would know they are lying and if they say it is right, then they can not avoid the next question "why couldn't you find it out early yourself ?". I will challenge anyone who can dispute the validity of it. As a matter of fact, I'll openly request the revision of the text book Gravitation written by Kip Thorne et al. and also others who wrote the book on gravitation. The part of the text books mentioning about the gravitational dipole moment is plainly wrong. Despite his knowledge of this fact since 1997 from private email, Dr. Thorne hasn't done anything about it. I seriously doubt his scholarstic integrity on this matter. As soon as a new major finding is published in the refereed journal, text books have to be revised to accomodate the new development for the education of the younger generation. Knowngly keeping the major development of physics from the view of the new generation of the students is a gross neglegence of the duty as a public servant. I publicly demand the revision of the text book "Gravitation" on the treatment of the part of dipole gravitational moment based on the paper published in 1999 in Physica Scripta and also on the materials subsequently published in the blog (http://dipoleantigravity.blogspot.com/). Especially the page on "Sign Error in Lens-Thirring Force?" is such a bombshell information. Everybody in physics study should be informed of it. I think this article is amazing. I want to know what dark matter feels like. I dont get what dark matter looks or feels like. If I were in space and I could reach out and touch dark matter what would happen? What would happen? However, it’s important to realize that the "dark matter" problem exists only in the context of one known long range force (gravity). Suppose there is another long range force that we are ignorant of. If this is discovered by future physicists then they will look back at this "dark matter" cosmology much the same way we now view the early "geocentric" cosmologies. The above is from Dr. Dark Matter (Greg Bothun)'s home page. Dark matter doesn't have to be an exotic matter. Any invisible ordinary matter in the universe is technically a dark matter. Many stars have invisible satellites and they can certainly be considered dark matters as well. In fact, if a collection of mattes does not follow the Newtonian gravity due to additional long range gravity, there is a great chance that they will not be visible. Any additional long range gravity force will prevent them from going through the regular nucleosynthesis to become a bright star and make them visible. Grow up Jin Jeong. If your theory is correct, it will get recognition eventually. I find no reason for anyone to be embarrassed for missing a scientific discovery that someone else has not. If you are correct, chances are there is something else you are missing about it. Will you be embarrassed when someone else alters your discovery? Even if you are wrong, science is a process and you should not only be happy with being right. Enjoy the process instead. isn't that kind of what Jin Jeong is trying to say. That since science is a changing process, then the newly learned information should not be hided on purpose or one should not stand by while the old-slightly wrong info is being printed on textbooks if one knows that there are newer more accurate updates. "about this dark matter stuff...does it make anyone else think about the things in life that we can't always explain with science, like spirits and supernatural events? " No, it most definitely does not! Things we can't explain today are exactly what is driving science. Using "supernatural" magic to explain what we don't understand or can't explain using today's science doesn't actually explain anything. It only makes you look foolish and childish. As recently as a few hundred years ago things we now consider obvious and mundane were explained by "supernatural" magic. People needed gods or angels to move glowing orbs in the crystal spheres to explain the movement of the planets. Now only very young children and abysmally ignorant adults would even consider such explanation reasonable. In the most-often given description of the Bullet Cluster, what is observation and what is interpretation get mixed up. The observations tell us that the hot gas component and the lensing mass have an offset. One good conclusion from this is: The visible, hot gas can not make up the majority of mass in the system. But a wrong conclusion is: The Cold Dark Matter Hypothesis is right.